Cheeseburger dumplings, tandoori ostrich and a dinosaur steak feature in this week’s reviews, which also demonstrate some serious love and respect for Bristol’s ever-increasing restaurant collection. She describes it as “a cavernous, two-floored space with a steakhouse upstairs” and also as “big, not very beautiful” – but the real draw is the meat-centric menu (featuring the famous Tomahawk, or ‘dinosaur’ steak) from chef patron Sam Elliot. While she’s not generally one for “consuming terrific amounts of bowel-blocking red meat”, she readily admits that Pasture has “one of those menus I adore: something for everyone and the devil hiding in 100 raunchy details”. The “merest afterthoughts” of chef Elliot’s menu had her delighted, such as “ash-baked beetroot with goat’s curd, elderberry vinegar and pecans” – “a sharp, crunchy pleasure”. Even the mac & cheese was “a powerfully sensual, four-cheese affair that my hips are still furious about”. 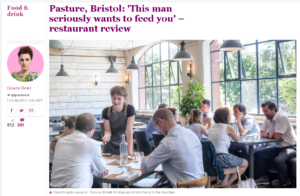 Sorry Bristol, but your secret is firmly out: Pasture “combines brilliant local produce, lovely, knowledgeable, chirpy staff and a reckless approach to pushing culinary boundaries”. 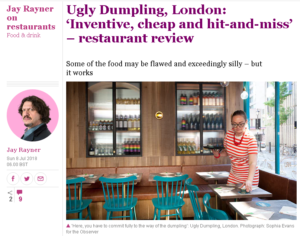 Jay Rayner in The Observer paid homage to the global food phenomenon of dumplings, pasties, gyoza and the like (“every race and creed has found a way to use up scraps of food by shoving them inside a skin or shell of some kind”) at Soho’s Ugly Dumpling. The two-floor space (once home to fellow pop-up-turned-permanent Pitt Cue) is somewhat challenging: Upstairs you are seated “so close together you can easily identify your neighbour’s brand of deodorant” but the alternative spot downstairs is “a dungeon of a space”. Food-wise, “results are profoundly mixed” – Jay recommends avoiding the ‘Street Food’ part of the menu, largely because “much better versions… are available five minutes’ walk away in Chinatown”. The ‘New favourites’, however, “are much more fun”, including the “exceedingly silly” but delicious cheeseburger dumpling. Dessert is “equally hit and miss”, although a pecan pie dumpling wins praise. All in all, the “weird overheated inventiveness” is fun, and the prices very decent, but for proper dumplings, go to Chinatown. 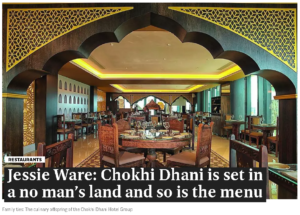 In The Evening Standard this week, guest reviewer Jessie Ware and her mum (both of food podcast Table Manners) visited Chokhi Dhani (4/10). 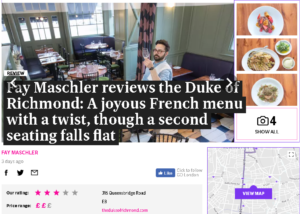 Fay Maschler’s welcome return to The Evening Standard was marked by a round-up of her week, plus a full review of The Duke of Richmond (***). The Duke’s ‘Frenchness’ is complemented by “little twists” provided by “east London sensibilities or the presence of a staunch British ingredient”. On her first, impromptu, visit, she enjoys the “truly excellent” sharing plate of whole roast Challans duck, with plenty of other “standouts” and service that has “buckets of charm matched by efficiency and good timing”. A second, official (and a bit more incognito), visit falls as flat as the “tomato confit tarte fine… on the wrong sort of pastry”. An entrecote steak “looks a shambles — only its mother would Instagram it” and service is “unfocused” (one waiter appears to be listening to Test Match Special on a “hidden earpiece”). All of which , Fay claims, proves why it’s “nearly always essential to visit a restaurant more than once before writing it up”. 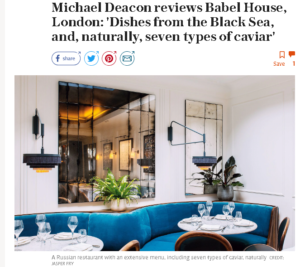 Micheal Deacon in The Telegraph reviewed Mayfair newcomer Babel House which provided him with “dishes from the Black Sea, and, naturally, seven types of caviar”. Tom Parker Bowles is on the drag. 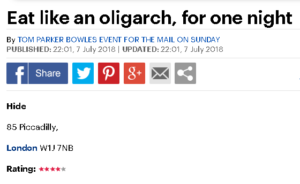 Last week’s review was posted online later than usual (he visited “on trend” Root (****) for some ” serious good food” and heartily agrees with our Grace about Bristol being “Britain’s second great food city” . This week he was at Hide (****), weeks after the other critics (and half of London) descended on it like a plague of locusts. He describes the decor as “A Midsummer Night’s Dream meets Uday Hussein’s bathroom” – and apparently the famous, much-Instagrammed staircase “looks like the digestive tract of some great mythical whale”. Admitting “it would be all too easy to sneer ” at the car-sized lift, the wine list “so immense that mere paper cannot contain it”, the built-in phone-chargers, the sheer size of everything, TPB turns to the food, and Ollie Dabbous, “an indecently talented chef who manages to combine the earthy with the light and lithe”. His verdict is that “the cooking is mainly sensational” from the ” gloriously puffy flatbreads” through to the acorn cake with “boozy smoked caramel sauce”, easily “switching from elegantly exquisite to old-fashioned fun”. But despite the food and service “as slick as it is sublime”, he won’t be back any time soon. “Hide lacks heart… see it as a thrilling one-night stand… then return to the real world”. In The Financial Times, Nicholas Lander enjoyed “oysters, scallops and views worthy of a Turner seascape” at Angela’s of Margate.